The Charge brand itself is based out of the UK and is a rider-owned company. The company features hardtail frames in its line-up of bikes as well as modern styling. Besides the Charge Cooker Ti 29er, the Charge brand showcases bikes that are used for cross-country riding as well as dirt jumping events. Hardtail bikes range from affordable, budget models to high-end cycles. All the bikes are made to surpass similar bikes in weight, performance, operation, and durability. The Charge bike features a Japanese titanium frame with a tapered and strong head tube, custom tires, lightweight knife saddle seat and brand new Skillet grips. In addition, the bike highlights a hydraulic disc brake, fork suspension, 29” wheel, double chainset, external routing cable, and unisex design. You’ll find that the featured components on the Charge Cooker 29er mountain bike give you amazing stopping power, the ability to absorb bumps in the road, and precision steering and handling. The 2013 titanium bike also comes with double bottle cage mounts, clamp front derailleur, rear derailleur, 20 speed gears, shifters, brake calipers, and basic flat pedals. However, to get the most from your riding experience, you may want to purchase clip-in pedals and shoes if you’re an avid rider. The Charge mountain bike comes with a three-year warranty on the frame, and a 12-month guarantee on its high-quality parts. The reviews that have been posted about the Charge Cooker Ti 29er mountain bike have all been positive. So, needless to say, consumers can feel confident about their purchase of this top-of-the-line bike. One reviewer wrote a rather lengthy summation about the Charge Ti 29er mountain bike, giving it five stars with respect to construction, aesthetics, comfort, ruggedness, weight, versatility, and fit. The brakes, he said, provided reasonably fast stops, although he said that the front brake felt much better than the brake located in the rear. He did comment though that the brake pads were not of the best quality as he had to replace the rear pads after only seven miles. The front pads, he said, lasted, about 50 miles. According to the reviewer, the frame of the Charge cooker bike looked great and the finish was easy to clean. However, he stated that the WTB Prowler tires on the cycle were perhaps a bit light. While they didn’t work great in the mud, they did work out well on other terrains. As far as handling, he said that the bike was, in one word – fast! He added that the hardtail bike was, as mentioned, nimble as well. However, because of its design, the bike still didn’t provide quite the animated ride, say, as a full suspension bike. Nevertheless, it was a fun cycle to ride. In summation, he said that the Charge Cooker Ti 29er mountain bike rated high with respect to looks and quality, with only a few tweaks needed for an ultimately fun ride. 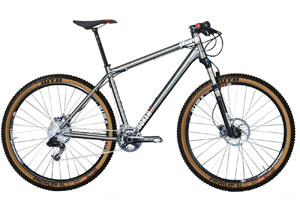 Another reviewer, whose fitness level was that of Ironman, did not offer as lengthy of review but was well-pleased, nonetheless, with the performance of the 29er. Again, the word, nimble, was used as well as the word fast. He said he was amazed at the quickness and agility of the bike, even when weaving through tight spaces and around trees. He said consumers did not have to even consider other 29ers as the Charge 29er mountain bike was indeed the best bike to select. Overall, the riders who purchased the Charge Cooker bike were very happy with their purchase. While one of the reviewers had to replace the brake pads and felt that the tires did not maneuver well on muddy terrains, he still didn’t subtract these deficiencies from his overall score or assessment. Both the reviewers gave the bike high marks for design, handling, looks, and speed.